Mark McNairy plastered his spring collection with smiley-faces, embossing them on everything from camo chinos to schoolboy backpacks, but our favorite use of the smiley might just be its application on a pair of bandanas. Would love to see how these would figure into the hanky code, the age-old nonverbal language that gay people use to signal their sexual fetishes. 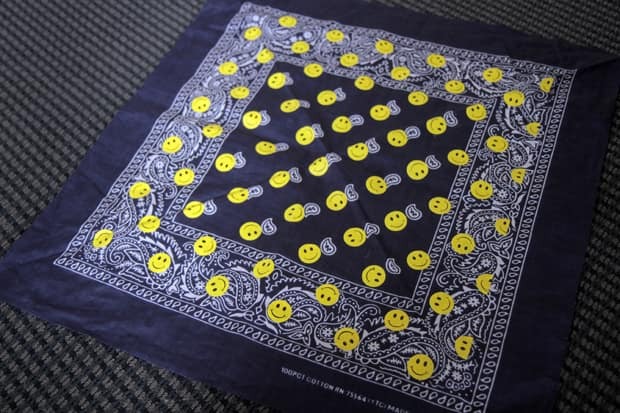 It comes in an orange-red, too, but whatever your pick, with these bandana's impending popularity in the menswear world, you'll be sending some strong signals in Chelsea.